— ABC's Diane Sawyer on Good Morning America, January 19, 2007. — ABC's Good Morning America, January 19, 2007. — Sawyer interviewing House Speaker Nancy Pelosi on World News, March 22, 2010. — Sawyer on Good Morning America, June 29, 2001. — Sawyer on the first night of the Democratic convention, August 26, 2008, Good Morning America. — Sawyer on World News, March 23, 2010. — Sawyer on Good Morning America, May 3, 1999. 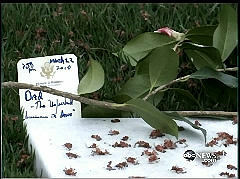 — Sawyer to Democratic Senator Barack Obama on Good Morning America, November 13, 2006. — Sawyer to New York Times columnist Maureen Dowd on the November 14, 2006 Good Morning America. — ABC's Diane Sawyer on Good Morning America, November 16, 2009. — Sawyer starting off ABC's Good Morning America, October 9, 2009. — ABC's Diane Sawyer on World News, March 21, 2010. 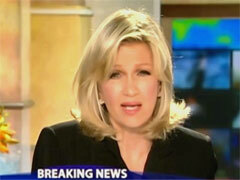 — Diane Sawyer leading off ABC's World News, April 23, 2010. — Sawyer on ABC's World News, June 18, 2010. The Arizona law does not target all immigrants, just those in the country illegally. — ABC's Good Morning America, February 13, 2007. — Sawyer reporting Yasser Arafat's death, Good Morning America, November 11, 2004. — ABC's Diane Sawyer introducing a report on Good Morning America, July 12, 2006. — Sawyer on same program. — ABC's Diane Sawyer on Communist leader Vladimir Lenin, during a Primetime Live special on the history of the Soviet Union, January 18, 1990. — Sawyer to Donald Gregg, the former U.S. 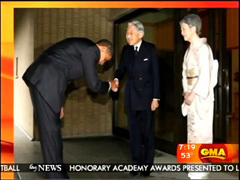 Ambassador to South Korea, on ABC's Good Morning America, October 9, 2006. — Sawyer in Afghanistan with the U.S. Army's 10th Mountain Division, April 10, 2007, Good Morning America. 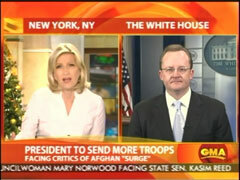 — ABC's Diane Sawyer to White House press secretary Robert Gibbs on Good Morning America, December 1, 2009. — Sawyer introducing a taped interview with the Dixie Chicks on ABC's Good Morning America, May 23, 2006. — Diane Sawyer to Bush campaign advisor Joe Watkins on ABC's Good Morning America, November 4, 2004. — Some of Diane Sawyer's questions to Starr on 20/20, November 25, 1998. — Good Morning America co-host Diane Sawyer asking Judge Robert Bork about special prosecutor Ken Starr and whether or his office was responsible for leaks while investigating Bill Clinton, February 1, 1999. 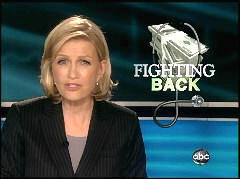 — ABC's Diane Sawyer teasing a segment on an abortion doctor's murder, June 1, 2009 Good Morning America. At the time, National Right to Life calculated 49,551,703 abortions had been performed in the U.S. since the Roe v. Wade decision in 1973. — ABC's Diane Sawyer setting up a Jan. 11, 2001 Primetime Thursday interview with Harris. — Sawyer to Republican presidential candidate Steve Forbes, June 1, 1999 Good Morning America. — Sawyer to Senator John McCain on Good Morning America, September 27, 1999. — ABC's Diane Sawyer first introducing and then wrapping up a story about Maine's Superintendent of Insurance reducing a company's planned rate increase, April 2, 2010 World News. — Diane Sawyer to new Senate Majority Leader Bill Frist on ABC's Good Morning America, January 7, 2003. — ABC's Diane Sawyer to Treasury Secretary John Snow on the March 5, 2003 Good Morning America. — ABC's Diane Sawyer, Good Morning America, April 27, 2005. On the violence issue, 6,500 people were killed in drug violence in 2008 alone, 95 percent of the guns used were out of the United States. What is the U.S. going to do to stop the guns from getting there?" — Sawyer to Napolitano, April 16, 2010 Good Morning America. — Sawyer asking Professor Arthur Miller about Lyle and Erik Menendez, brothers who were later convicted of murdering their parents, December 15, 1994 Good Morning America. — Exchange on Oprah, February 19, 1997.